Did I mention we eat a lot of pasta? Rat Boy thinks this is the best thing I cook. So I do it a lot…just because he’s the resident rodent. 🙂 Plus, it’s easy, and generally makes at least two meals! Dice onion and finely chop garlic. 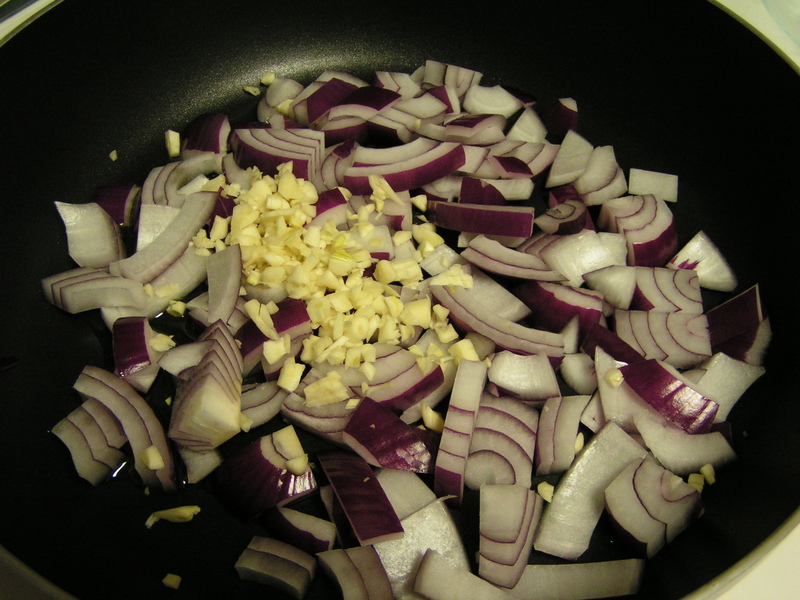 Saute on medium using a bit of olive oil until the onion is translucent and it starts to smell delicious. I use a LOT of garlic. We lurves the garlic! 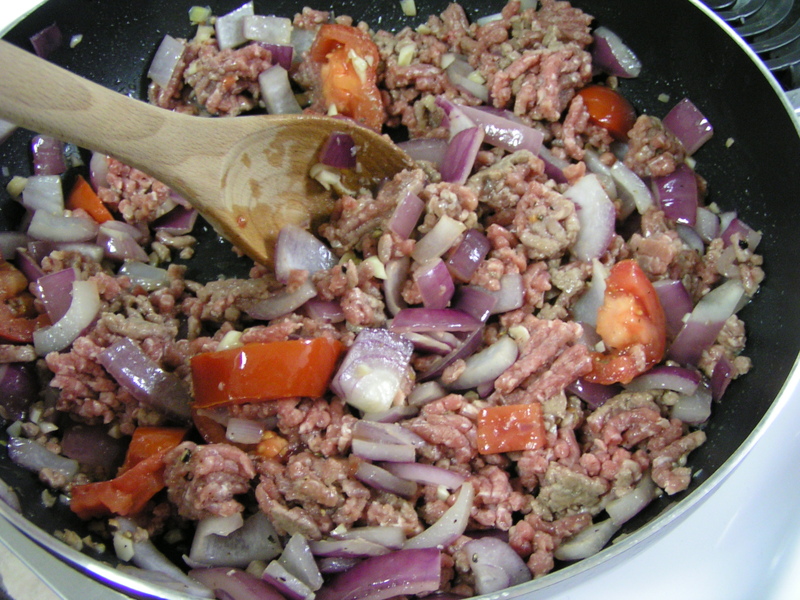 Add about 1 pound of ground meat. 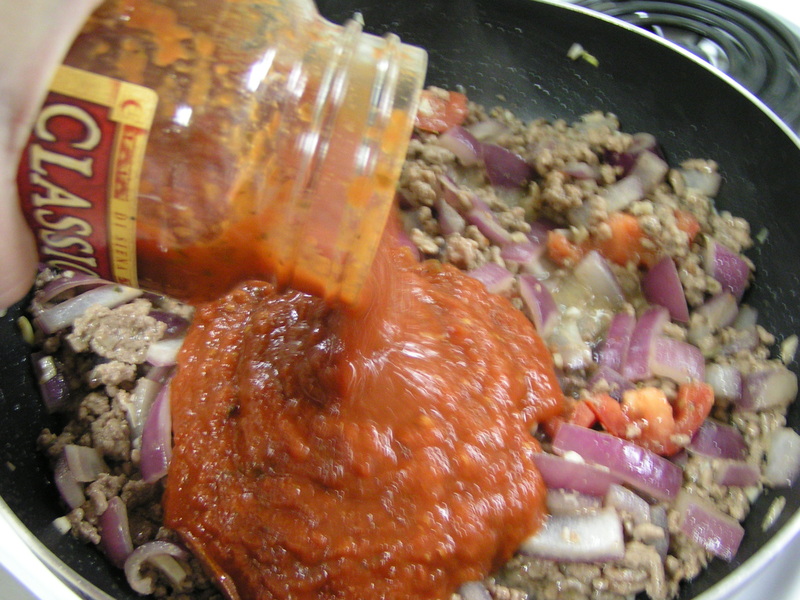 I’ve made this sauce with beef, grass fed beef, buffalo, and pork. It all works! Coarsely chop a tomato or two and throw them in as well. This is a great end for the tomato that’s just a little too ripe to eat, but not so ripe that it’s headed for the dust bin. When the meat is browned, pour in a jar of pasta sauce. My favorite is Classico tomato and basil. Yes, more basil. I also add a couple of cans of fire roasted, diced tomatoes. I like the variety that has olive oil and garlic. Yes, more garlic. I think this is the part that gives the sauce its special taste. Pepper to taste, stir well, cover and simmer on low heat for at least 2 hours. This really makes the sauce. I do it on the stove, because I’m home, and because it only makes 2 pans for washing this way. However, for the simmer you can use a crock pot as it will do the job just as well without burning down the house. Give it an occasional stir. 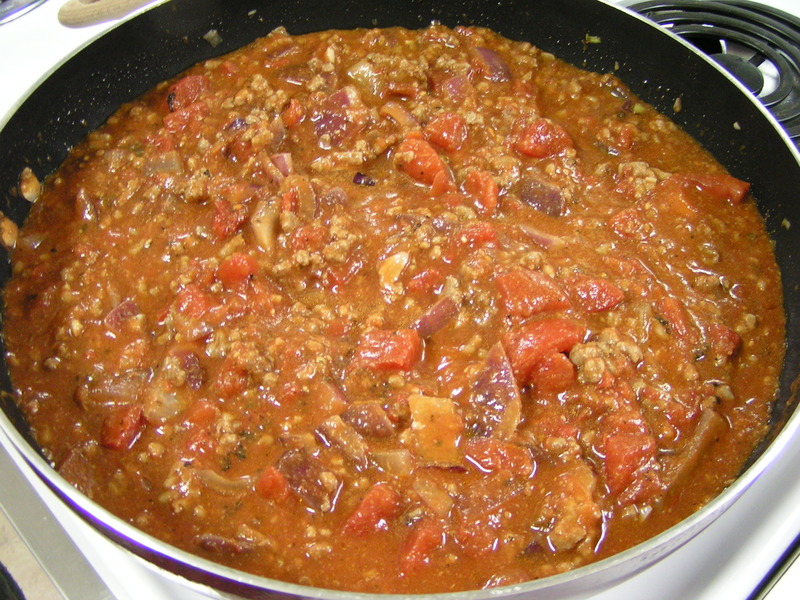 Make sure it’s still simmering, but not cooking too hot, as it will burn if too much liquid evaporates. And burned pasta sauce makes everyone a sad panda. I’ll garnish with coarse chopped fresh basil. Yes, more 😛 And some lots of Parmesan. 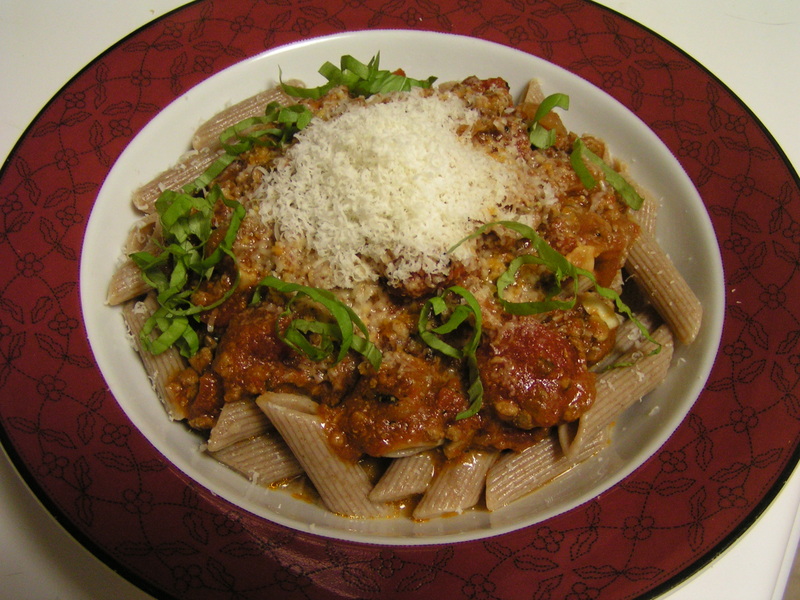 This is actually the Einkorn pasta that I mentioned to the Queen in a previous comment. It’s whole grain, and quite tasty, lacking that cardboard character that some of the whole wheat pasta has. That looks and sounds delish! 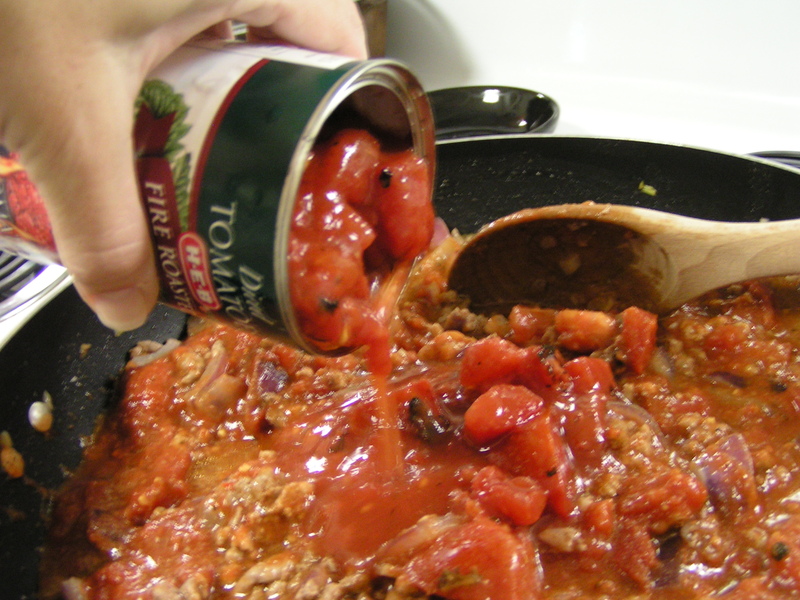 I use that same brand of canned tomatoes… Harry is a good guy to buy from! Good and easy. I think I will do this one for my sister’s brood.